Photo Caption:(L-R) AirAsia Philippines Head of Ancillary Karlo Sanchez, COO of Amorita Resort Lyba Godio and AirAsia Philippines CEO Capt. Dexter Comendador flanked by AirAsia Cabin Crew. BOHOL, 4 July 2018 – AirAsia is taking travellers on a delightful food adventure on board with the airline’s latest in-flight offerings and hot meals featuring Filipino all-time favorites and the best of Asean flavours. The airline which has been voted the World’s Best Low Cost Carrier for nine straight years formally introduced “Santan inflight menu and catalogue” at a press event held in Bohol today in partnership with Amorita Resort. Fresh new items in the Santan menu are Beef Tapa with scrambled egg, Chicken Bicol Express, Chicken Kare-Kare, Tuna Sisig, Chicken Adobo Bunwich, Chicken Empanada and Halo-Halo pudding dessert are now available for pre-booking online and on board all AirAsia Philippines flights starting July 11 from as low as P60.00 for desserts and P150 for a la carte hot meals. 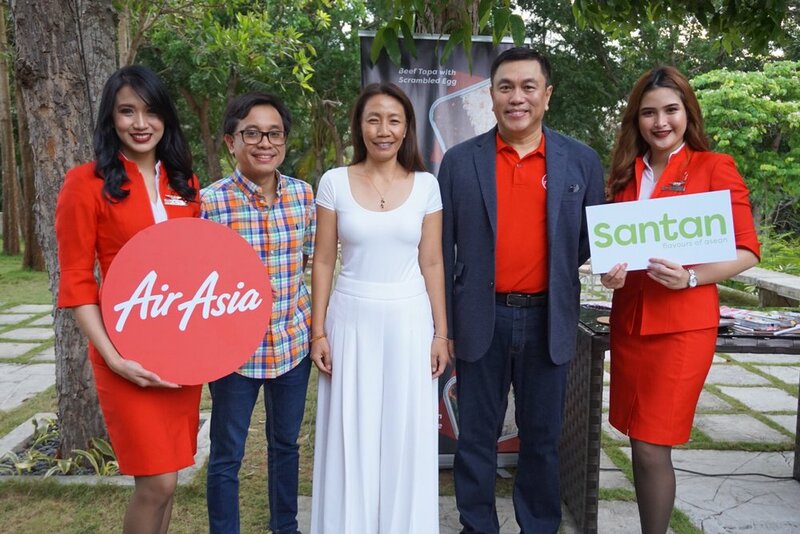 AirAsia Philippines executives led by the airline’s CEO Captain Dexter Comendador and Head of Ancillary Business Karlo Sanchez and group of media and bloggers flew from Manila to Bohol to celebrate and they were joined by Amorita CEO Nikki Cauton and Head of Marketing Kata Agimata. AirAsia’s all-time favorite meals like Nasi Lemak, Chicken Rice, Chicken Lasagne, drinks and beverages are also part of the new Santan menu. AirAsia won the World's Leading Inflight Service title at the World Travel Awards Grand Finals in December 2016, and was also honoured with the Catering Innovation of the Year award by Onboard Hospitality earlier last year. “We value customer experience at all points of the journey – from the purchase of the ticket to leaving the airport, on board, and to the destination. This latest enhancement in our in-flight menu makes flying with us also a delightful dining experience,” Comendador added. Follow the AirAsia Santan journey through the hashtag #AirAsiaSantan and get the latest AirAsia news, activities and promotions on Twitter (twitter.com/AirAsia) and Facebook (facebook.com/AirAsia).